One of my readers commented a few weeks ago letting me know that the reason why she started following along with me in the first place is because she loved my remixes. 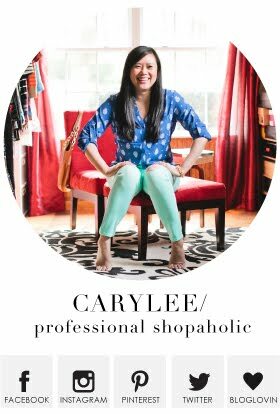 That really means a lot to me, and honestly, I do pride myself in my ability to showcase different ways to style the same piece. I admit that I side eye some people who claim they are "remixing" but they are really just "accessorizing." To me there is a big difference. Proving something is versatile is more than just saying - oh look you can wear this with flats AND boots. Remixing is all about mixing colors and textures and prints and pieces in a way that makes you fall in love with that piece all over again as if it is brand new. Since I'm now five years into blogging, I have a LOT of outfit photos and I want to share a lot more remix ideas this year. I've done an olive skinnies remix post before here, but it was time to do another! So let's get started. 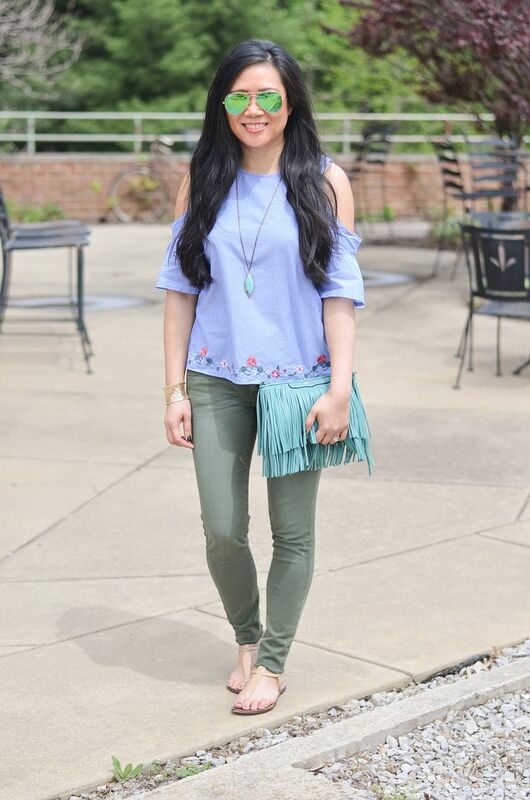 In the spring, I love pairing turquoise and blues with olive. Olive is inherently fall-feeling to me, so the pops of turquoise help keep it feeling more warm-weather! 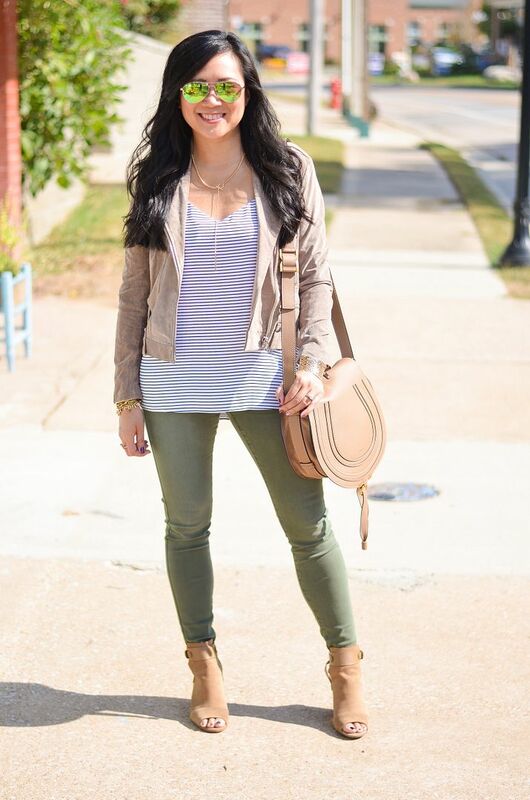 Naturally, your basic neutrals will always pair well with olive. 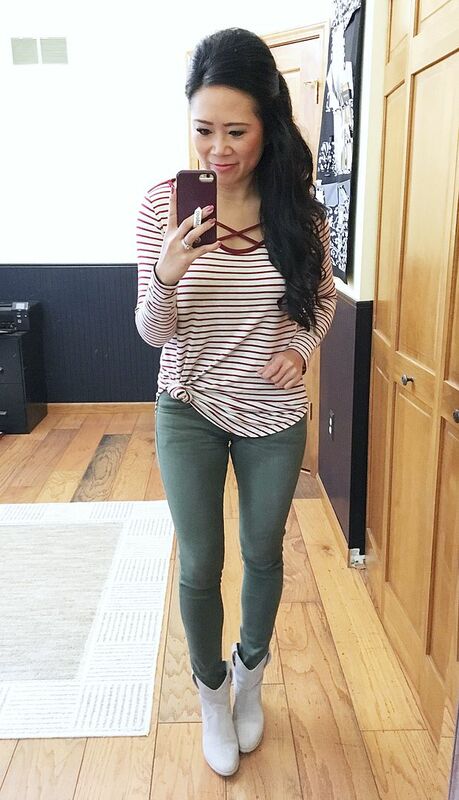 Suede on top, suede on the bottom, simple stripes and a simple necklace all make for a pretty foolproof but fresh combination. I received a lot of comments on this outfit that mauve was an unexpected, but great pairing with olive. 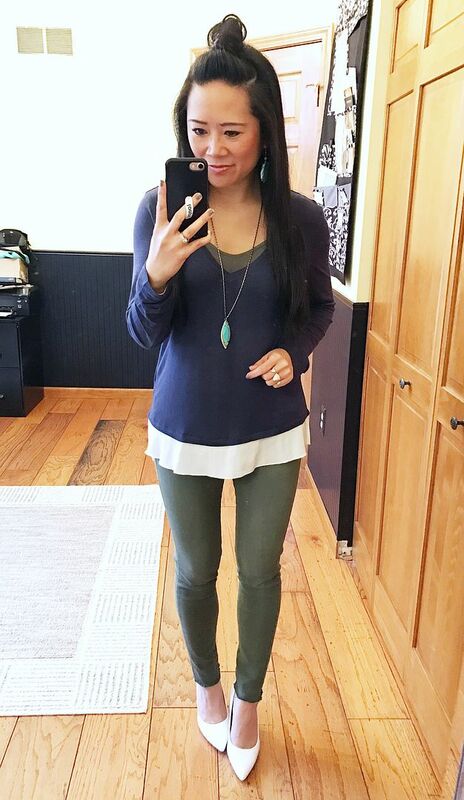 Mauve is definitely not a color I would think of first when it comes to olive, but it works! Olive and burgundy were made for each other, let's be real. This outfit was fun to wear because of all of the layers. The waterfall cardigan under the moto jacket adds a nice touch of interest. And the boot socks make me happy. 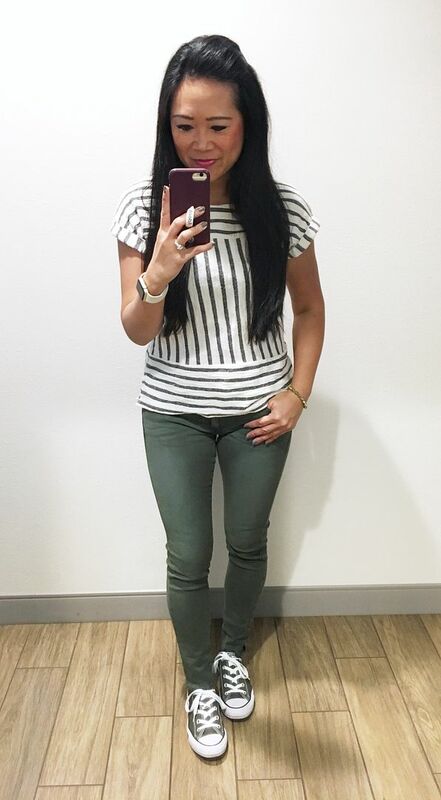 This is my most recent olive skinnies outfit. Again, blues pair naturally with olive to me. The pop of red in the bag is unexpected, and the navy keeps the red and green combo from looking like Christmas. Go bold or go home, right? 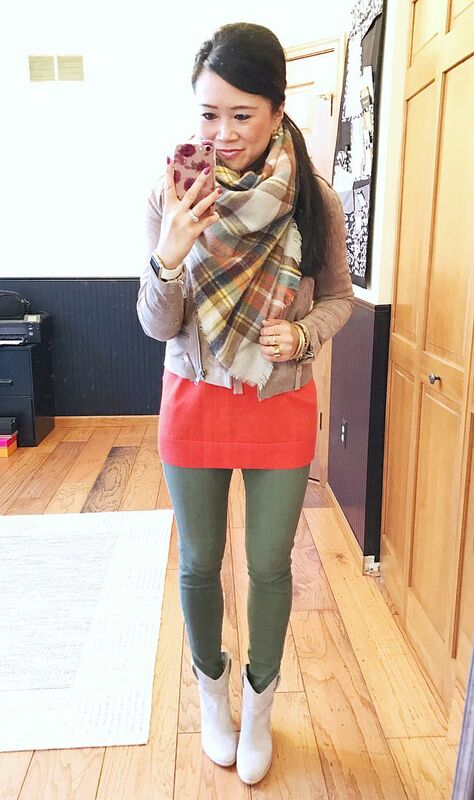 Bright orange is so fun with olive and the neutral jacket and plaid scarf help ground the outfit a bit. I've already shown you that navy pairs well with olive, but I had to add this one to the mix because I loved the way the white pumps looked here. 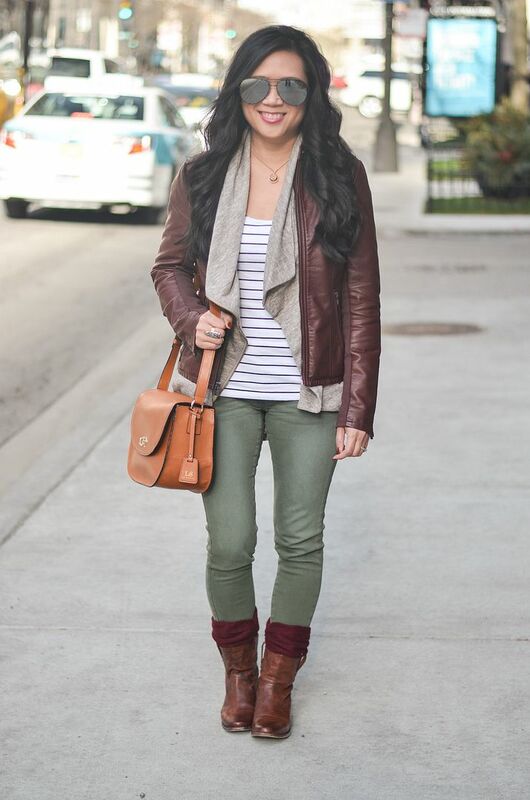 This is a great transitional combo. I am convinced that there is nothing a good stripe and a pair of Chucks can't go with! Don't forget that you can always knot your longer tees if you don't feel like going tunic-lengthen that day. The silhouette of this outfit would change a ton had I left the top unknotted. Peach is also perfect with olive, especially with the small pop of turquoise. Add your fave pair of espadrilles and this is a great summer outfit. 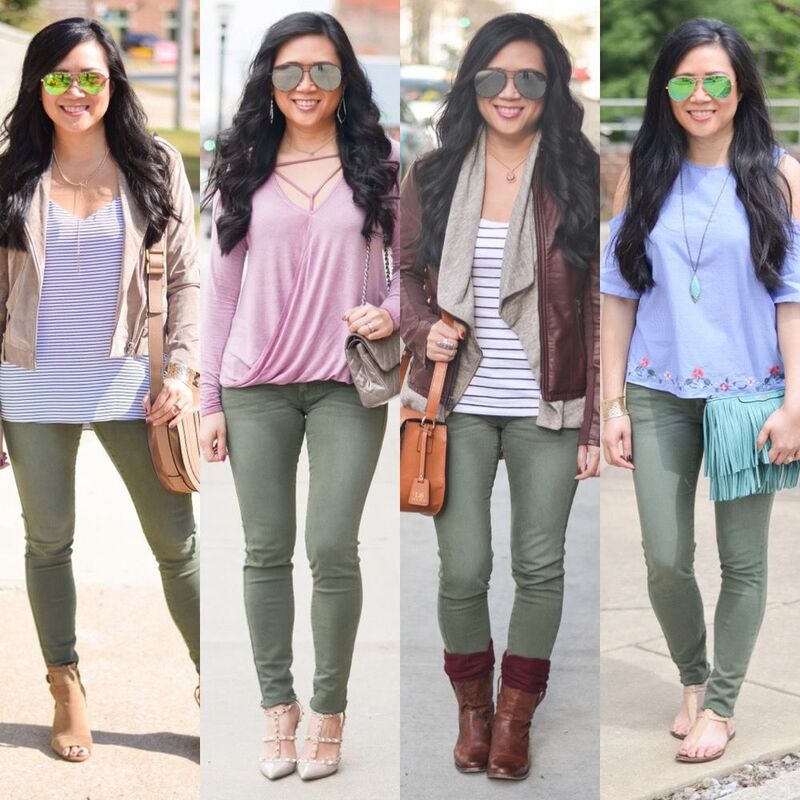 If you don't have a good pair of olive skinnies, you definitely need some in your life. They're my next favorite color to wear other than your traditional blue, black, white, or grey denim. 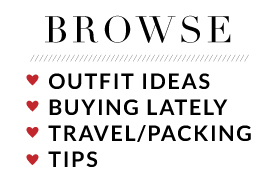 I've linked to a few pairs in my "shop" widget below! Happy styling! Olive jeans or pants are a must in my opinion. I'm so glad you'll be doing more of these posts this year! I find them so helpful and tend to refer to them often if I have a similar piece or am debating the purchase of a similar piece. I love remix posts they are so fun to do. This is such a versatile piece. My favourite look here is the mauve combination. That is such a pretty colour.